Cinabar rather excitedly said to me a few days ago that the famous Belgium chocolatier, Godiva, have started to mass produce chocolate. There are lots and lots of caramel bars on the mass produced market, so I wondered how this compares. Whilst she wasn't looking I stole this chocolate bar from under Cinabar's nose. Some people are easily distracted with pretty colours or an alternative snack she hasn't seen before! Unwrapping the bar I was impressed by the overall presentation. 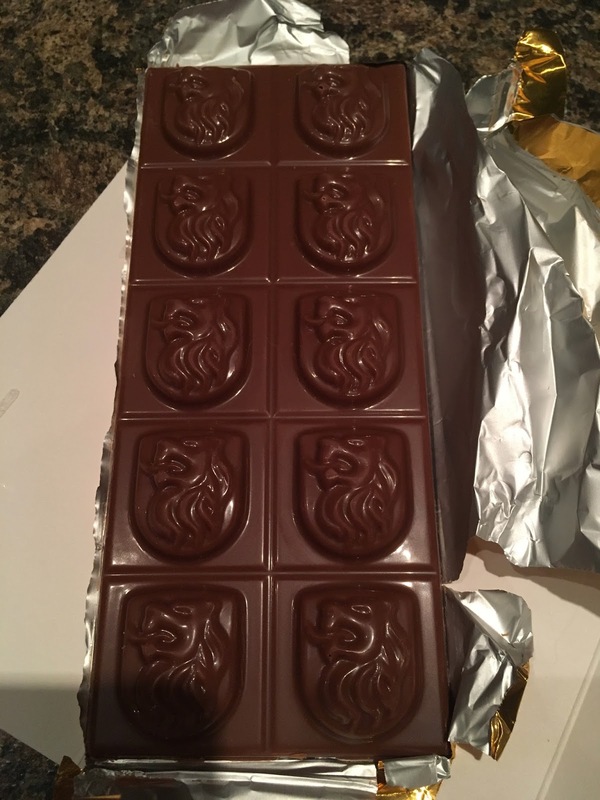 A Lion's head crest on each of the twelve square pieces of milk chocolate. The first thing I noted on biting into a chocolate crested square was how creamy the succulent milk chocolate was. However, the base is solid milk chocolate. Certainly very luxurious milk chocolate, but not filled with a caramel centre. This wasn't exactly true to the image on the front of the cardboard packet. In fact each lion's head crest on top of each base was filled with thick gooey brown sweet caramel. Okay, so not true to the image, but these chocolate pieces were certainly very tasty and felt like a step up from some of the mass produced brands. 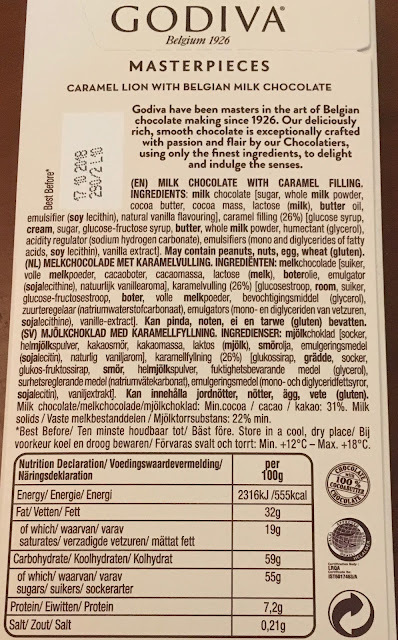 However, it's all about the milk chocolate here, as mass produced brands generally have more caramel in them and certainly have excellent quality milk chocolate, if not as amazeballs as Godiva's Belgian milk chocolate. 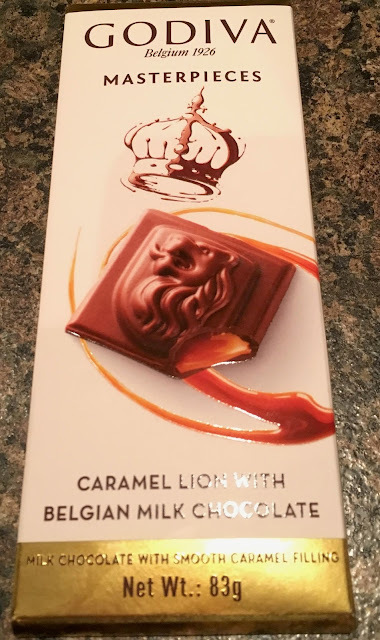 I can't comment on price, because generally I get mass produced brands blended with the weekly shop and I nicked this Godiva Caramel Lion with Belgian Milk Chocolate bar for nothing from Cinabar's usually tight chocolate loving fingers! 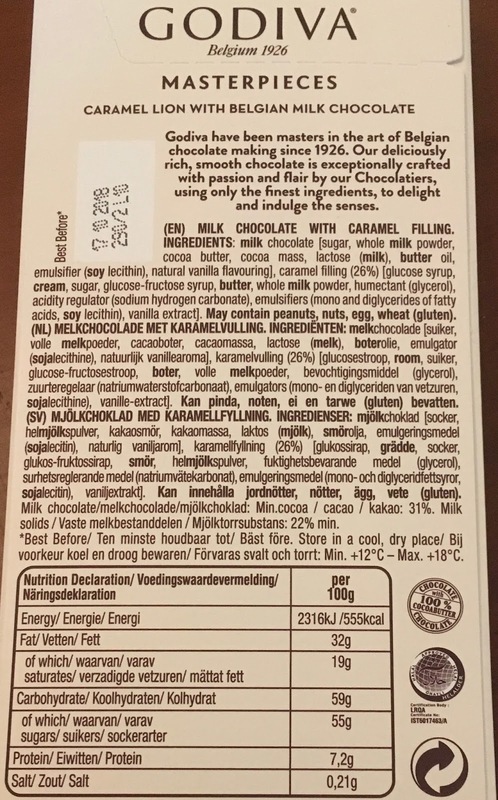 The 83g bar had 555 calories per 100g, with 32g of fat, 55g of sugar, and 0.21g of salt. For ingredients please see photograph.